This tour is a full day long tour starting from the central of Belfast at 9 in the morning. If you are a fan of Game of Thrones and you would love to see some of the scenes from the TV series and if you are interested in the UNESCO listed Giant’s Causeway this is the ideal program for you during a holiday in Belfast. The tour begins from the central of Belfast where you can just hop on the bus and start your tour right away. The tour includes free hop on and drop off from the hotel where you stay. The tour is led by a local guide and the whole tour has a friendly and open atmosphere. 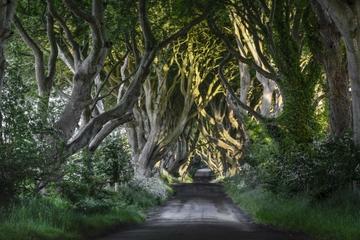 During the tour you will see some of the key filming locations of Game of Thrones. While you are on the way to the north of Ireland your tourist guide will talk about the world wide known series the Game of Thrones. The first stop will be in Cushendun which is an Irish city and you will have the chance to discover the caves where Melisandre of Asshai gave birth to her shadow baby. The next location will be Ballycastle where Varys was born as a slave. As you will travel further north you will see the most photographed parts of Ireland where Arya Stark dressed as a boy to escape from King’s Landing. After checking out the Ballycastle the next stop will be Carrick-a-Rede Rope Bridge and the fishing village of Ballintoy where you can have lunch on your expenses. The tour ends at the UNESCO listed Giant’s Causeway. If you want to know more on the tour check the following site for more information. For more information on other guided tours in Belfast, read on in our Belfast Guide.